This site has previously discussed the Puzzled Pint event, which takes place in a pub in London, a pub in Montreal and nine pubs across the US on the second Tuesday of each month. Imagine a pub quiz, but lose the questions and replace them with puzzles, dial the atmosphere down to accessible, casual and hint-filled, and you and your team are more or less there. London was the third city to start, and now the event is up to eleven! Many thanks to the global team organising the event and to London organisers Dan and Lisa for the hard (but hopefully fun!) work they have put in over the past year and a bit. However, it’s very difficult to find a pub in central London in December which is prepared to host, perhaps, 60 or so people on a Tuesday evening which doesn’t have the ambition of using its space to host a Christmas party. Companies will plunk down deposits of hundreds or thousands of pounds, which squeezes Puzzled Pint out somewhat. It was possible to get away with it when Puzzled Pint was very small (three teams small) last December, but these days it’s too big. 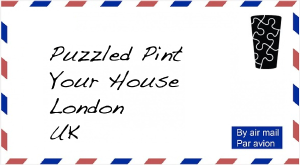 So there’s an intriguing option available for the London PP this month only: register in advance and you can play by mail: “We send you puzzles on Tuesday, you send back team name & solve time. E-mail us to sign up!” This site loves the history behind this option. Chess has been played by mail since at least 1824, possibly hundreds of years longer. More interestingly, the seven-player game Diplomacy has been played postally for over fifty years, and even more ambitious games have been designed to take advantage of the specific properties of playing games by mail for over forty years. Arguably the genre reached its peak in the ’80s and ’90s as the most accessible way to play a game with more people than could be fit around a single board game table; the likes of Monster Island and Quest could whimsically be considered the first MMORPGs, years ahead of your World of Warcraft and the like. It’s just that the graphics were primitive and latency has improved by a factor of tens of millions, from days to milliseconds. Thinking more broadly, could Puzzled Pint exist as a game by mail on a longer-term basis for other cities where in-person events are not yet established? Puzzled something certainly could, in the long tradition of timed online puzzle contests, and would be fun. However, it wouldn’t be Puzzled Pint, where so much of the appeal is getting together with your friends in person to crack the puzzles – and possibly to get to see people from other teams who you only ever see at these events. This site is sure that teams will be meeting up for this stop-gap PP this month, but it’ll be many little events rather than one big one. Volunteers are sought to help run the event in London through 2015. That said, it’s not clear if there can be effective checks as to just how London-based people wanting to play this month’s London event can be. Perhaps playing by mail for a month is a privilege not to be abused for fear of diluting the ethos of the event, but perhaps this might be a chance for people who can’t make every London event to more conveniently join in the fun.